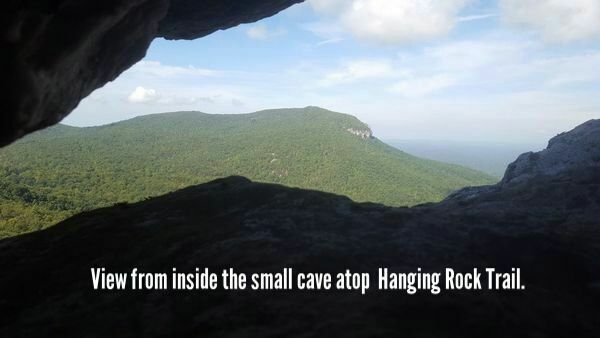 Hanging Rock State Park in Danbury, NC has plenty of trails to explore with several caves and waterfalls. Friday afternoon we will hike the steep 3 mile round trip to "The Hanging Rock" before setting up camp. This relatively short but often challenging hike is well worth the spectacular vistas at the top. Saturday our group will explore the many trails making sure to visit a few caves and waterfalls. With all the trail options in this park individuals can opt moderate or challenging day hikes from the campsite. There is alot to explore. Sunday we can have a day of leisure, explore nearby parks or hike more trails at Hanging Rock. Staying Sunday night is an option for those who can return home Monday. 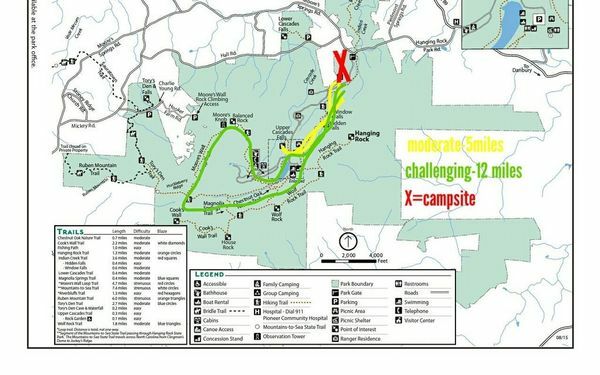 Hikers will need to bring all the provisions and gear needed to live in campground for two nights(it's not wilderness camping). There is the town of Danbury near by which has restaurants, grocery stores and such. Walking distance from parking lot to campsite varies from 30 to 180 yards. Hand carts are recommended for carrying gear to sites. All food and food containers should be locked inside a vehicle at night or when absent from the campsite. The park gate closes and is locked at night. Access in or out is not permitted during closed hours. . This campsite has a bathhouse and fresh water nearby, but no electricity(campfires are allowed and wood is available on site).